BOSTON, MA -- That does it for another busy week across the Eastern Hockey League (EHL). This past week's schedule included 17 of the 18 EHL teams in action, in 21 total games. There were a number of key points earned, and that was especially the case for the Philadelphia Little Flyers, as they won all three of their matchups and clinched the South Division of the Mid-Atlantic Conference. 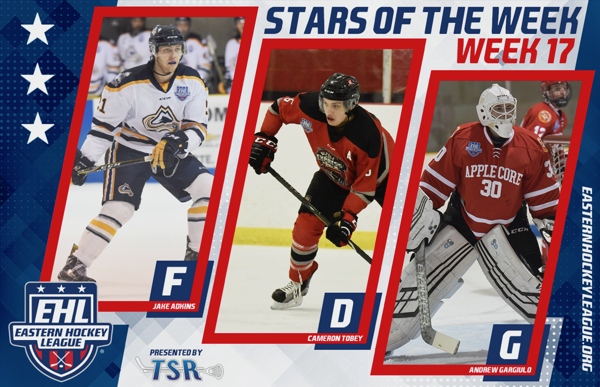 The EHL is pleased to announce that Mason Emoff (Vermont Lumberjacks), Freddie Ilias (Connecticut Chiefs), and Nathan Pickett (New Hampshire Avalanche) have been named the TSR Hockey Stars of the Week. The action doesn't slow down this week, as once again, there is at least one game per day (tomorrow through Monday). 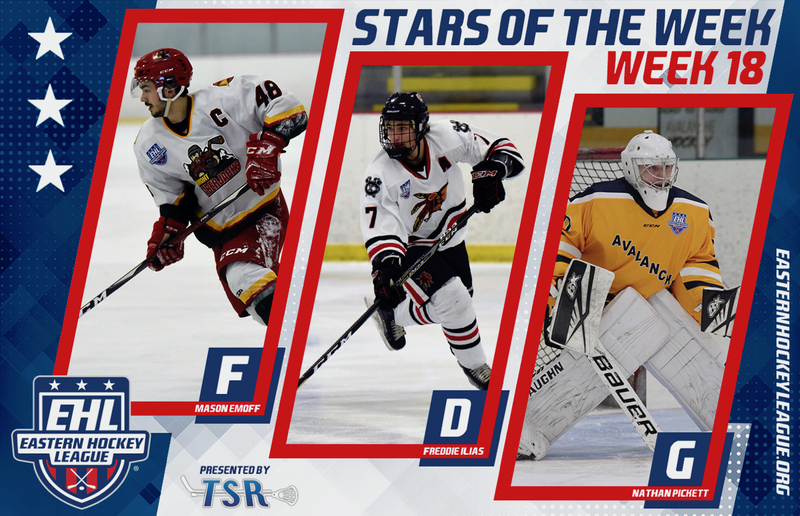 The upcoming schedule features another 20 matchups, and the next set of TSR Hockey Stars of the Week will be released on Monday, February 4th. Remember to catch the #Eshow all season long on HockeyTV. Emoff and the Lumberjacks swept their two-game series with the Philadelphia Revolution, and moved their way up to #3 in the latest set of #Eshow Power Rankings. With the pair of victories, Vermont improves their perfect 2019 record up to 5-0-0, since the team returned from the holiday break. As for Emoff, the '98 forward from Ontario, Canada scored a trio of goals and dished out three assists as well in the pair of victories. For the season Emoff now has 17 goals and 21 assists in 32 total games to date. After being held off the scoresheet in the first two games coming back from the holiday break, Emoff has turned the tables with nine points over his last three contests. Looking ahead, Vermont will look to stay hot this week with three more games on home ice, starting with the Connecticut RoughRiders on Thursday at 12:50pm. Ilias and the Chiefs battled their way through a tough three-game stretch this past week, as they continue to try and climb their way into the New England Conference playoff picture. As for the 2000-born defenseman who's also from Ontario, Canada, Illias scored a pair of goals and collected three assists for his team. Overall, Ilias now has 25 points in his first season of junior hockey. The Chiefs are on the outside looking in right now, and they will look to lean on their top defenseman down the stretch. This week's schedule for Connecticut includes matchups against the East Coast Wizards, New York Applecore, and Connecticut RoughRiders. Pickett and the Avalanche continued to roll this past week, as they won all three of their matchups and moved themselves closer towards clinching the North Division of the New England Conference. As for the '99 netminder from Auburn, MA, Pickett was between the pipes for all three games, improving his overall record up to 17-1-0 for the year. To go along with his nearly perfect record, Pickett also owns a 1.69 GAA and .941 save percentage, which each rank him towards the very top of all eligible goaltenders in the EHL. Looking ahead, Pickett will look to move his team closer towards clinching a First Round bye with a matchup on Wednesday against the Boston Jr. Rangers. Dominiks Marcinkevics and the New England Wolves are in a tight battle for the 6th and final playoff spot in the New England Conference. Despite being one of the youngest players in the EHL, the 2001-born forward from Riga, Latvia continues to set the bar as the top goal scorer in the league. Marcinkevics added five goals to his name this past week (three games), giving him 30 to date in his first season of junior hockey. Daniels Leja of the New Jersey 87s is getting more comfortable with his new team, and that’s noticeable with the back-to-back hat-tricks that he has tallied in his last two games. Overall, Leja now has eight goals and five assists in his first nine games with New Jersey.